BALLOON CLASSIC & FIREWORKS ACTIVITIES: Hot air balloons fly best in less than 8 mph winds, and the weather must be almost perfect for these beautiful balloons to take to the skies. Pilots are briefed on weather before each and every flight; flights may be delayed or cancelled due to weather conditions. Helpful hints: If you’re an early bird, come check out the morning flights! For evening flights, traffic is especially heavy, so plan ahead. Is parking available? Yes. Parking is only $5.00 after 3:30 p.m. in the Kent State University at Stark/Stark State College lots. There is limited disabled parking available to those who present their disability parking permit. Can I bring my own tent? Tents are not permitted to be installed in the event. Not only can they be dangerous but, they also block the view of others. When will the balloons glow? The illuminating NIGHT GLOW is scheduled for Friday night at 9:30 PM but is also weather dependent. Watch as the balloons “dance” to music – it's quite a sight to see! When are the fireworks? The spectacular FIREWORKS show is on Saturday night at 10:00 PM., once again, a bit weather dependent. What kind of entertainment can I expect to see? All kinds! The Balloon Classic & Fireworks offers a variety of entertainment. From giant hot air balloons, to fireworks, food, music and a children’s education area – this is quite an event to see! Can I bring Fido? Sorry -- no. You will definitely enjoy this event, but it is not a place for pets. We do not have doggy port-a-johns or water stations, so please leave Fido at home. Many animals are frightened around crowds or loud noises such as fireworks. Service dogs are welcome. Will the balloons take off or land near my home? We wish we could say yes, because watching these big beauties is fascinating, but their location is 100% based on the winds! Pilots are briefed on wind speed and direction before each flight, which dictates where they will take off and land. Keep your eyes to the skies! Why was a flight cancelled? Please take a look at the attached Balloon Launch Weather Criteria. There are many weather factors that go into the hot air ballooning world. What should I bring? Please bring blankets and/or chairs for seating. Don’t forget your cameras! Food and drinks are available for purchase, as well as souvenirs. Can I go on a balloon ride? Sorry, no. Due to liability and insurance, spectators are not permitted to take balloon rides at the event. How close can I get to the balloons? Spectators will have a great view of the balloons from just about anywhere but are not permitted on the launch field which is reserved only for pilots, crew, and credentialed media. 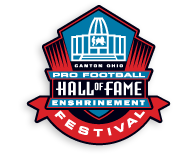 Where can I eat and stay during the Enshrinement Festival events? Please check out www.visitcantonstark.com for more information.